Hey there! Thanks for dropping by Beer n Shtuff! Take a look around and grab the RSS feed to stay updated. See you around! The first time I ever had a can of Wild Onion’s Jack Stout, I was sitting by a campfire in Door County Wisconsin. I was surprised at how good it was as microbrew from a can is still a shock to me…so I was astounded that anything from a can could really be so good. Several weeks later, I found time to sit down with a second can. I poured it into a pint glass and watched as a creamy tan head formed atop the blackest of ales. Holding the glass to my nose…or maybe my nose to the glass, I was greeted by the aroma of roasted malt mingled with coffee and chocolate. Jack Stout is quite tasty. It is rich and creamy. Slightly sweet with intense coffee flavors. Maybe its the creaminess, but there are moments where Jack Stout reminds me just a bit of Guinness. Jack Stout is smooth and quite drinkable. It would make for a good session ale…perfect for a night of playing cards or just hanging out. 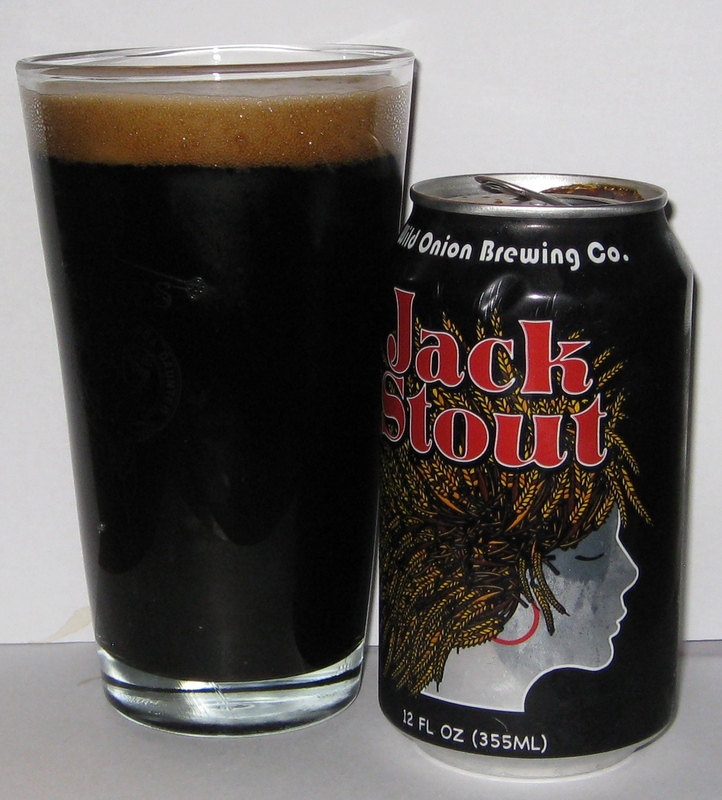 If you enjoy a good stout, Wild Onion’s Jack Stout is the beer for you. For my Guinness hating friends out there…don’t worry…while the creaminess is certainly reminiscent of Guinness, the intense flavors and complexity of Jack Stout leave any similarity to Guinness in the dust. So give it a try pick up a Jack Stout. I think you’ll like it…and once you’ve had one, cans # 2 and # 3 won’t be far behind.